A few years ago when I was in school for nutrition, I took a course in food safety. We happened to be learning about proper thawing and cooking techniques for turkey right around Thanksgiving time, and one of them involved the possibility of food poisoning from stuffing cooked inside a turkey. Most of us had not heard about this, and sure enough, when we returned from the Thanksgiving holiday, one of my classmates had gotten food poisoning from the stuffing at her relative’s meal! No one wants to make their guests sick, and of course no one would do this on purpose. But there are a lot of food safety protocols for cooking turkeys that just aren’t widely known. Many people learn from their mothers, who learned from their mothers, and so on. Well, the meat was probably a little cleaner and safer back then, and unfortunately in today’s world, we need to take some extra precautions to make sure our turkeys are handled safely. Here are a few turkey safety tips, and a wish for a happy, healthy, and very delicious Thanksgiving holiday. In the refrigerator. Allow 24 hours for every 4-5 pounds of turkey. Place the turkey in a container so the juices do not drip on other foods. A refrigerator thawed turkey may remain thawed in the refrigerator for 1-2 days before cooking. In a cold water bath. Place the sealed turkey in a large container of COLD water and change the water every 30 minutes until the turkey is thawed. Allow about 30 minutes per pound, and cook the turkey as soon as it is thawed. In the microwave. Follow microwave instructions for thawing a turkey. The turkey must be cooked immediately after microwave thawing because some areas of the turkey may have gotten warm in the thawing process. I DO NOT recommend this type of thawing except in an emergency because microwave cooking is so uneven. Prevent cross contamination. I know I talked about this a couple of weeks ago but let me reiterate. All hands, cutting boards, knives and other surfaces that come into contact with raw meat or poultry should be washed thoroughly with soap and water before contacting any other foods. Keep your stuffing safe. It is optimal to cook stuffing in a dish outside of the turkey. 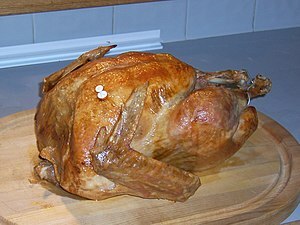 If you choose to cook stuffing inside your turkey, place the stuffing inside the turkey just before cooking, and use a food thermometer to ensure that the center of the stuffing reaches at least 165° F. Any part of the stuffing that does not reach this temperature carries a risk of bacteria that can cause food poisoning. This is serious and how my friend from school got sick!! Cook safely. Make sure the turkey is completely thawed, and set oven temperatures no lower than 325°F. The meatiest parts of the turkey should reach a minimum internal temperature of 165°F. Let the turkey stand for 20 minutes before removing the stuffing and carving the meat. For more information on turkey safety, check out http://www.cdc.gov/features/turkeytime/. The recipe for this week comes from Chef Ann Cooper. These Cornmeal Apple Griddle Cakes were yummy little pancakes, and I even used gluten-free flour and they came out great. 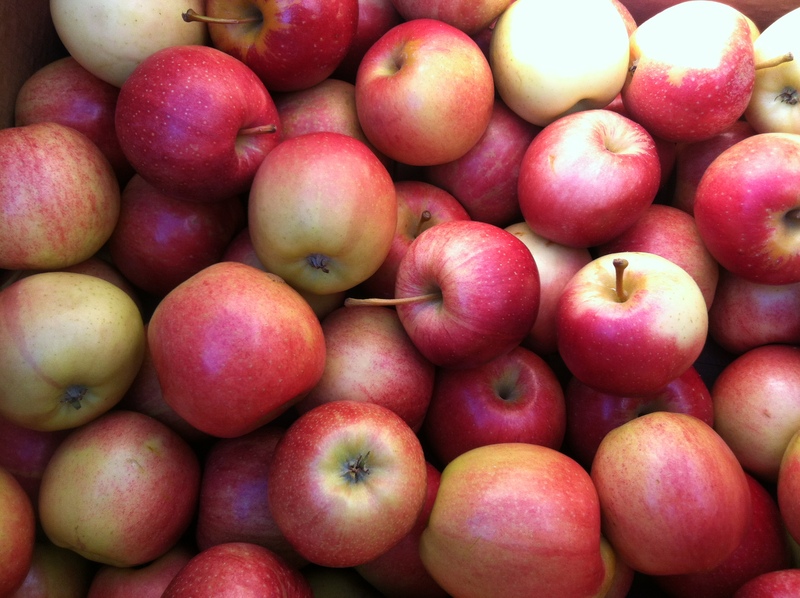 They were delicious with our Vermont Maple Syrup on top, but I didn’t feel like they were apple-y enough. Next time I would probably add some cinnamon or apple pie spice to the mix.